Over the past many years, there have been many, many calculators of the TI-83, TI-83+, and TI-83+SE persuasion that have suffered from the dreaded "black LCD" syndrome. You can power them on and off, you can see them and their contents via linking programs like TI-Connect, but it's impossible to see anything on the screen other than solid black. Over the years, I've been fortunate enough to acquire quite a few such calculators from sources such as colleagues and eBay, but until a few weeks ago, I assumed that the failure was in the tiny surface-mounted black square that takes the 15 pins of signal data from the calculator's CPU and turns it into 96 columns and 64 rows of data (plus contrast and power settings) for the LCD. 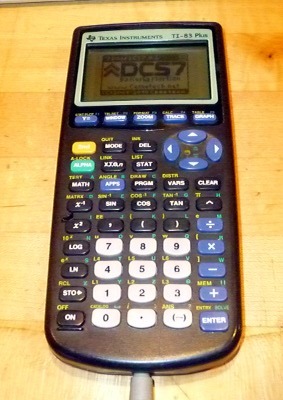 Fortunately for me, my discoveries of the real solution started with a calculator with a garbled LCD. Indeed, it was a TI-83+ that behaved like a TI-84+ with a bad LCD delay: on the homescreen it was more or less fine, other than a few garbled characters, but launch Doors CS and it suddenly started rotating the screen by 2 bytes (for you non-ASM types, the rightmost 16 columns of pixels pushed their way over to the left side of the screen). To me that indicated some kind of skewing in the data being send to the LCD, but that wouldn't be a true failure of the LCD controller, since the homescreen was fine. 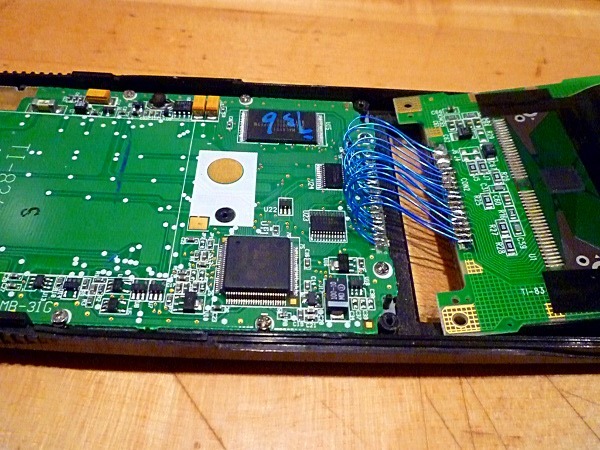 Intrigued, I pulled out my multimeter and checked the ribbon cable connecting the calculator's mainboard and its LCD module. To my great surprise, I found that a few of the connections had resistances at least one or two orders of magnitude higher than the others, even though all appeared connected. I wavered for a bit, then took the plunge. 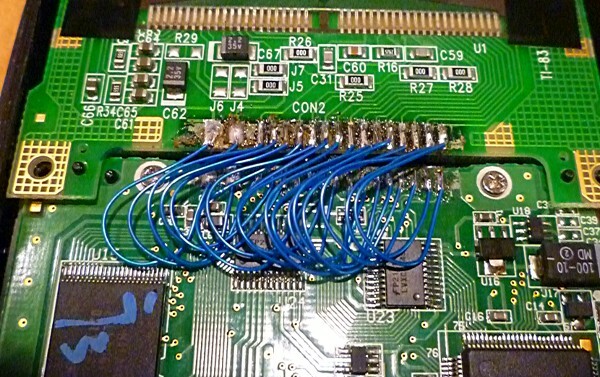 Whipping out my trusty soldering iron, I burned away the metallicized plastic trace from the offending connections, cleaned the respective mainboard and LCD PCB traces, and carefully soldered some 30awg wire into place. After a few adjustments, I turned on the calculator to discover that the LCD was behaving like the day it rolled off the assembly line! Since then, I have fixed about five calculators in my collection displaying solid-black LCDs or garbled LCD behavior via partial or full replacement of the ribbon cable connecting the LCD PCB and main PCB. The photos below are from tonight's adventure, a particularly ambitious one in which I transplanted the working LCD from a calculator with a completely dead mainboard, to a mainboard that showed up on TI-Connect but refused to even display a black rectangle when power was supplied to the LCD. Here are some details of the repair, plus a gratuitous pic of the functioning calculator. Protip: 30awg wire stripping: nail clippers! Thanks for that tip, Internet. That is some amazing work right there Kerm, that deserves a nice pat on the back. Thanks Sonlen! I appreciate the accolades. Good work, Kerm. Looks like a "fun" soldering job. Why not use the right tool for the job? Yeah, one of these days I need to get a pair of those. I did some searching after tiring of using my teeth as 30awg strippers, hence the nail clipper solution, but that would be far superior. Is there no Z80 in there? My calculator looks like this on the inside. I guess they may have moved parts into an ASIC to reduce the cost. 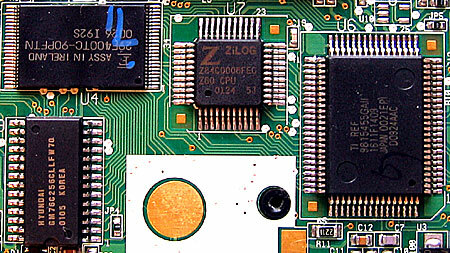 Yup, the one that I repaired in the photographs has the bus manager chip and the z80 itself merged into a single ASIC. I have quite a few different varieties of mainboard; I should try to catalog them all one day. when soldering something like this, how do you keep the individual contacts from shorting each other? I'd be you could consult http://datamath.org to figure out which revision is which. Absolutely; I think I'd be interested to see if I have anything that they don't. @Dshiznit: You mainly need to have a steady hand. Luckily, rosen core solder's flux helpfully promotes surface tension and helps solder form lumpish shapes instead of spreading out too much. Well, although it is for someone like me an easy soldering job, I'm sure many people would lack the skills, materials, patience, and experience. Indeed, in the long run it might be easier and better for them to just tell the calcs at a loss and live with it. Mufin pointed out on IRC that I could probably resell the calcs that I fix for a hefty profit, and he's right, but I have no particular intention of doing that in the near future. Luckily, rosen core solder's flux helpfully promotes surface tension and helps solder form lumpish shapes instead of spreading out too much. *rosin (Sorry, but I had to). The flux is most useful as a reducing agent, which prevents the heated metal from oxidising (solder does not adhere well to oxidised metal). When using flux cored solder you typically apply it to the joint as you heat it, which releases the flux. However, if you apply liquid flux to the PCB first you can put a small blob of solder on the end of the iron and "paint" the joint. (Doing this without the flux tends to result in a poor quality blobby joint that doesn't stick to the board properly). Ah, that makes sense; I was a bit misinformed about that then. I do indeed tend to pre-apply some solder on the joints for this kind of case, which isn't technically the correct way to solder, but if I'm careful about it it seems to work well and produce decent-quality joints. Thanks as always for the clarification, Ben. Yeah, that's my view as well. The only thing that occurred to me is I could sell fixed calculators in order to buy more broken calculators to fix to keep and test CALCnet2.2 networks, but I don't think I have the time and patience for that. I do indeed tend to pre-apply some solder on the joints for this kind of case, which isn't technically the correct way to solder, but if I'm careful about it it seems to work well and produce decent-quality joints. I wasn't aware that tinning the surfaces to solder and the iron was technically incorrect; it works well and forms a good joint. When it comes to soldering SMT parts with a regular iron I don't think there's a correct technique, just whatever works for you! Well, I think it's considered better to heat both sides of the join first, then apply the solder, remove solder, remove heat, right? For these I pre-tin the contacts, hold the wire against the cold solder, apply iron to remelt the solder and envelope the wire, remove heat, wait two seconds for solder to harden, let go of wire. It seems to produce joins that are mechanically and electrically more than strong enough. O_O wait, can this happen on a TI-84, or are they safe? The TI-84 has a much harder to replace ribbon cable, and one that's more substantial and thus less likely to fail than the 83+ version. It's less likely to fail, and less likely to be fixable. So one of the new (old?) broken calculators I recently purchased arrived today. This one shows interesting symptoms: no LCD activity at all on poweron/poweroff, but if I massage the ribbon cable and put it back together, a single black line appears on poweron and poweroff, indicating to me that it's misinterpreting the power command. Further news as I continue to investigate this calc. © Copyright 2000-2019 Cemetech & Christopher Mitchell :: Page Execution Time: 0.099787 seconds.